For long-term investors, when the Fed raises interest rates is irrelevant to the construction of a high-quality bond portfolio. It seems that everywhere you turn, the press is asking, “When is the Fed going to raise interest rates?” While that may be the question du jour, for long-term investors, the question is irrelevant to the construction of a high-quality bond portfolio. Rather, here are the 10 things you should be focusing on. 1. Understand the role bonds play in a portfolio. When it comes to managing a bond portfolio, many investors, especially retirees, are mainly focused on generating income, but investors need to be aware of the risks taken to achieve a set amount of income in today’s low interest rate environment. For example, when interest rates are low (and bond prices are high), the income approach would cause an investor to buy more bonds, extend duration or accept lower credit quality in order to maintain a certain level of income. Likewise, if you think back to the early 1980s, when you could lock in long-term bond rates over 10%, the income approach would cause investors to own fewer bonds — even though the lower prices (higher yields) were a once-in-a-generation buying opportunity. A better approach is to divorce the cash flow decision from the income decision. To do this, an investor needs to set a rational asset allocation, periodically rebalance to that target, and allow the total return of the entire portfolio to satisfy any income needs as opposed to viewing the interest generated by a bond portfolio as the sole source of income. Once a monthly (or some other frequency) withdrawal rate that meets an investor’s living expenses is determined, some combination of interest, dividends and proceeds from maturities and sales will provide enough cash to meet the withdrawal each month. Importantly, should there not be enough cash during a particular month to meet the withdrawal, the determining factor in whether to sell bonds or equities will be the asset allocation. If equities have been soaring, they should be trimmed back to the target to generate cash, and if equities are down, interest and proceeds from bond maturities should be used versus being forced to sell stocks at a bad time. In addition to allowing a bond portfolio to provide stability to the value of the overall portfolio, this approach also ensures that the portfolio will have dry powder to invest in equities in the event of a broad market sell-off simply by rebalancing to its target asset allocation. This forces an investor to “sell high” when prices are up and rates are low and “buy low” when prices are low and rates are high. More importantly, maintaining a disciplined approach to rebalancing keeps an investor from panicking during times of market stress or otherwise playing the impossible game of trying to time the market. Bonds don’t need to be rocket science. For most investors, a simple bond ladder is the easiest, lowest cost and safest way to invest. By buying bonds with laddered maturities starting at one year and going out to, say, eight or 10 years, a bond portfolio becomes relatively insensitive to whether interest rates are going up or down. If rates go up, the proceeds from bonds maturing every year can be used to purchase bonds at what are now higher rates at the end of the ladder. If rates go down, the bonds that are maturing in the next year or two may have to be invested at lower rates, but the majority of the portfolio would still consist of bonds purchased previously with higher yields. Ironically, the investors hurt the most by today’s low rate environment were those who thought they were being “conservative” by buying only short-term instruments in 2007 or 2008 — things like money markets and shorter-term CDs. However, as the Federal Reserve lowered short-term interest rates to near zero, these investors saw their income plunge by 75% or more within a year or two. For investors who aren’t comfortable buying individual bonds, a similar portfolio can be assembled by buying a combination of short- and intermediate-term high-quality bond funds. To most investors, liquidity is not important most of the time. Unfortunately, when liquidity is really needed is when some bonds will most likely become illiquid. Investors who tried to sell long-term or lower credit quality bonds in late 2008 and early 2009 learned that lesson all too well. For most clients investing in taxable accounts, sticking to high-quality short and intermediate bonds should, for a large portion of their fixed income portfolio, mitigate the effects of these occasional liquidity crises. However, many investors place too high a premium on being 100% liquid. If an investor is going to venture into less liquid investments in hopes of higher returns, it probably makes sense to do so in an IRA or other tax-deferred account given that these will likely be the last assets they tap into. The longer time horizon can work in their favor for some portion of a bond allocation that may be in a tax-deferred account. A good example right now is non-agency mortgage-backed securities. These were pools of mortgages that were put together pre-2008 that weren’t guaranteed by a government agency like Fannie Mae, Freddie Mac, Ginnie Mae or FHA. For investors and advisors who can find some of these old (higher-quality) pools of mortgages, it’s not unusual to buy them at yields that are meaningfully higher than what an investor might get on a corporate bond with similar credit quality or duration. But there is a downside (there is never a free lunch). They are very illiquid and need to be viewed as self-liquidating investments versus planning to sell them prior to maturity. Much is written about the relative merits of buying individual bonds versus bond funds. Mathematically, a portfolio of individual bonds should perform similarly to a bond fund that possesses the same duration and credit quality. However, as a practical matter, owning individual bonds has two psychological advantages over owning bond funds. The first advantage is best explained in this personal anecdote. In the mid ‘90s, I was a fee-based financial planner, and I was agnostic as to whether clients invested in low-cost bond funds or laddered portfolios. Then an interesting thing happened when rates rose more than 2.5% between October 1993 and November 1994. Although the value of clients’ bond accounts went down by about the same amount regardless of whether they owned bond funds or individual bonds, the reaction of those clients who owned individual bonds was very different from the reaction of clients who owned bond funds. The clients who owned individual bonds were much calmer and willing to weather the decline in market value because they knew they would recover 100 cents on the dollar of every bond (assuming no defaults) if they simply continued to hold their bonds to maturity. The actions of other investors, which forced bond funds to liquidate at inopportune times, would not alter this fact. Investors in bond funds were not as sanguine as they watched the net asset value of their bond funds drop and unrealized market value losses became realized within the fund as other investors redeemed. The second advantage of owning individual bonds is that an investor can really know what he or she owns. A bond fund’s average credit quality doesn’t tell you whether a fund has 15% of its assets in Puerto Rican GO bonds, whether it owns derivatives or whether it is leveraged. 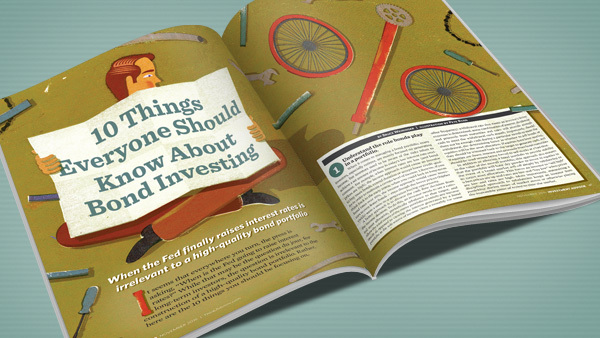 If an investor believes that the primary purpose of his or her fixed income investments is safety, then an investor will take solace in being able to easily see that his or her bond portfolio is reflective of that goal. The lack of immediate transparency of many bond funds makes that harder to achieve and could easily lead to unease on the investor’s part if the market takes a turn for the worse. In short, whether interest rates are rising or falling, an owner of individual bonds is more likely to stay the course and not do something irrational and potentially harmful based on a temporary change in market conditions. In this low interest rate environment, the 1% cost of the average bond fund (according to the Investment Company Institute), can eat up more than a third of the income that is being generated. There is a reason that Vanguard is continuing to take market share for fixed income mutual fund investors. For clients who have managed accounts that include both stocks and bonds, why do advisors charge the same 1% fee for both? Wouldn’t it make more sense to charge a higher fee for equities and alternative investments where the difference between being in the 75th percentile and the 25th percentile of returns can mean a difference of 3% or more, and then lower the fee that is being charged on bonds to better acknowledge that smaller standard deviation between managers (to say nothing of the lower absolute returns)? 6. Keep current on the tax code. Under normal conditions and assuming identical credit quality, a tax-exempt municipal bond trades at a lower yield than a taxable corporate bond. This is the natural state of things because, theoretically, the average marginal tax rate of investors forces the after-tax yield of the taxable bond to equal the yield of the tax-exempt bond. However, if a particular investor’s marginal tax rate is below the rate that equates prevailing taxable and tax-exempt yields, that investor’s after-tax return would be maximized by purchasing the taxable bond. Another way the tax code can create opportunities for an individual bond investor relates to the alternative minimum tax, or AMT. Because inflation was not considered, more and more investors are subject to AMT each year. If an investor is subject to the AMT, private activity bonds (a special class of municipal bonds often related to “business-type” government operations) should be avoided because otherwise tax-free income counts as income in the alternative minimum tax calculation. The opportunity is created because most mutual funds and institutional investors will avoid bonds subject to AMT as a matter of course, which reduces the demand for these bonds and, correspondingly, increases the yield. If an investor knows he or she will not be subject to the AMT, then private activity bonds can be purchased without cause for concern at yields that are typically superior to other similarly rated municipal bonds. 7. The benefits of resident tax incentives must be weighed against other risks. For investors who live in states that give a state income tax exemption for interest earned on in-state municipal bonds, they need to weigh the risks of concentrated credit exposure against the tax savings. Should a resident of, say, California, despite living in a state with a high state income tax, have 100% of the credit risk in their portfolio tied to the state of California and related city or infrastructure projects? Probably not. At the very least, an investor in this situation should own some pre-refunded or escrowed-to-maturity municipal bonds issued by that state in order to mitigate the credit risk. 8. Bond purchases are never free. While much has been written about the merits of a fiduciary standard that applies to a managed account as compared to the “suitability” standard that applies to a brokerage account, nowhere is the difference more apparent than for investors in individual bonds, and nowhere is the concept less understood by investors. If $100 was deposited in the Treasury every time an investor said “their guy doesn’t charge them for bonds,” the national debt would be paid off in short order. Although many brokers truthfully say, “I won’t charge you a management fee for the bond purchases,” what is left unsaid is that they are selling investors bonds from their inventory. In other words, they are taking the other side of the transaction and they are going to mark up the bond by an amount that they will never disclose to you. As an investor, incentives matter. Paying a stated management fee assures you of getting fiduciary execution — meaning that the advisor is on the same side of the table as the investor — versus giving a broker the perverse incentive of making more money only if the investor makes less. 9. Know whose credit is ultimately backing a security. If an investor was asked if he or she would invest 5%, 10% or even 15% of his or her bond portfolio in a bond backed by a single bank, the vast majority would politely decline. However, perhaps unbeknownst to them, many investors have effectively taken this exact position in their portfolio by investing in structured notes. And in the vast majority of cases, this concentrated credit risk was never disclosed to the investor. Besides the fact that the level of an index or the price of a commodity can easily decline beyond the point that these notes offer downside protection over the course of a year, the most problematic risk is that these structured notes are only as strong as the bank issuing them. And as investors in structured notes that were issued by Lehman Brothers found out in 2008, they have to line up with all the other unsecured creditors in the event of a bankruptcy — regardless of the investment results in the underlying security. If the yield on a bond or bond fund looks too good to be true, it usually is. In today’s environment, if a bond or bond fund is yielding over 4%, it means the security possesses substantial credit risk, substantial interest rate risk or is using leverage to goose its returns. While this is not to say that all risks are always bad, an investor should understand why the yield is higher and have the opportunity to assess whether the potential reward is worth the risk.